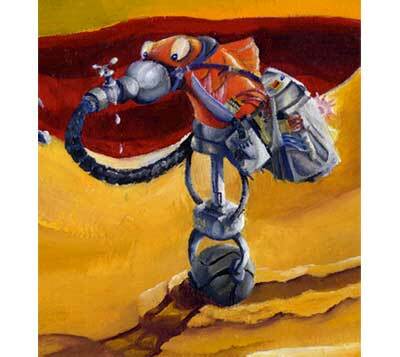 The Space Fish, was a project illustrated entirely in oil paints. Whilst never officially used, "The Space Fish" was a great example of how oil paints can be used to create a distinguished look for childrens books. Oil paint is a great paint to use for creating thick, rich designs, such as the sandy surface of the planet shown above. Oil more than any other paint brings with it a very distinguished look.